Credit cards are as common in the wallets and pocketbooks of Americans as family photos, yet there is a great deal that people don't know about credit cards. The following facts and figures should help fill in some of the blanks. Credit cards are big business, but more than that, credit is an essential lubricant that keeps the free market economy moving. This is a big part of why the government placed such a high priority on keeping the major U.S. banks solvent. It isn't just wealth that matters to an economy; without liquidity--i.e., ready access to that wealth--an economy becomes stagnant. Credit cards help provide that essential liquidity. There are approximately 173 million credit card holders in the United States. In all, there are over a billion--1.488 billion, as of the latest Census Bureau figures--credit cards in circulation. Dividing the number of cards by the number of cardholders indicates that the average credit card owner has more than 8 different credit cards. Credit cards are used to purchase nearly 2 trillion dollars worth of goods and services annually. This represents roughly one-seventh of the total U.S. economy. Who is issuing all this credit? It comes from several different sources, but there are some clear leaders. Retail store credit cards represent the greatest portion of cards issued, at 38.6% of the total. Bank credit cards are close behind, at 37.7% of the total. Oil companies issue 5.2% of all credit cards. The remainder includes issuers such as airlines, rental car companies, and phone companies. Although retail stores issue slightly more credit cards than banks, bank cards are used for the lion's share of total purchases, representing 64.2% of the annual dollar volume. Among banks, JP Morgan Chase has the greatest market share of purchases made at U.S. merchants, at 14.5%. This represents a narrow lead over Bank of America at 14.1%, and American Express at 13.9%. Citibank is next at 7.2%. In terms of card brands, Visa is the worldwide leader, with 60.3% of global purchase volume. MasterCard is next at 28.4%, followed by American Express at 10.0%. Visa, MasterCard, and American Express are truly the big three, as no other brand represents more than 1% of global purchase volume. Naturally, an industry this large did not spring up overnight. Some trends in credit card usage indicate how credit cards got to where they are today -- and where they might be going. Credit cards have been around for about fifty years, but America's dependency on them has really mushroomed over the past twenty-five years. In May of 1984, Americans had $87 billion in revolving credit outstanding. By May of 2009, this total had increased by more than ten-fold, to $928 billion. Since the beginning of 1968, revolving debt outstanding has grown at an annualized rate of 17.19%. While credit card debt has grown at a double-digit annual rate in general, the growth rate tends to slow as a result of recessions. It is a reflection of the length and depth of the most recent recession that 2009 has seen the first year-over-year declines in revolving credit outstanding in the 40+ years for which figures are available. Long-term though, credit card usage continues to grow. The U.S. Census Bureau reports that total U.S. credit card purchases increased from $1,242 billion in 2000 to $1,950 billion in 2006, and projects that they will grow to $2,747 billion in 2010. One factor that may slow the long-term growth trend is the spread of bad credit among American households. As people develop bad credit histories due to struggles with mortgages and other loans, and as issuers raise standards for credit scores, the approval rate for applications is likely to decline. As the numbers suggest, credit cards are an integral part of the U.S. economy--and of the everyday lives of Americans. Where does this credit card habit come from? 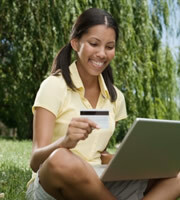 People routinely apply for a credit card at an early age, and after that the credit habit is constantly reinforced. According to a recent survey, 84% of college undergraduates have at least one credit card. These college students charge an average of $2,200 on those cards for school supplies alone. Recent legislation might slow this early usage of credit cards. The Credit Card Accountability, Responsibility and Disclosure Act of 2009 raises the minimum age for having a credit card to 21, unless a parent, guardian, or spouse co-signs for the card, or unless the cardholder can prove sufficient income to justify the credit limit. At whatever age Americans first discover credit cards, that is only the beginning. US households receive approximately 5 billion credit card applications and offers per year. The average American household receives about 6 credit card applications and offers each month. Between $1 billion for advertising and $4 billion for direct mail marketing, credit card companies spend about $5 billion per year to promote their products. The response rate to credit card solicitations is low, at about 1/3 of 1%, suggesting that the market is close to saturated. Total revolving credit outstanding tops $900 billion. The average cardholder has over $5,000 in credit card debt outstanding. This debt burden has begun to take its toll. Thirty-five million Americans (or roughly 20% of all cardholders) make only the minimum monthly payment on their cards. Paying only the minimum significantly increases the length of time it takes to pay off the debt, and thus adds considerably to the total interest paid. The credit card default rate reached a record 10.76% in June of 2009, though the delinquency rate was beginning to abate by that time. Like the mortgage industry, the credit card business sees examples of abuse and overuse, but the vast majority of people use these forms of credit successfully. As a result, credit cards are likely to remain a major factor in the U.S. economy, and an important source of convenience for merchants and individuals. 0 Responses to "2010 Report on Credit Card Usage - Facts & Statistics"